Connection pooling in Aiven PostgreSQL services allows you to maintain very large numbers of connections to a database while keeping the server resource usage low. Aiven PostgreSQL supports three different operational pool modes: "session", "transaction" and "statement". The "session" pooling mode means that once a client connection is granted access to a PostgreSQL server-side connection, it can hold it until the client disconnects from the pooler. After this the server connection will be returned back into the connection pooler's free connection list to wait for its next client connection. Client connections will be accepted (at TCP level), but their queries will only proceed once another client disconnects and frees up its backend connection back into the pool. This mode can be helpful in some cases for providing a wait queue for incoming connections while keeping the server memory usage low, but has limited usefulness under most common scenarios due to the slow recycling of the backend connections. The "transaction" pooling mode on the other hand allows each client connection to take their turn in using a backend connection for the duration of a single transaction. After the transaction is committed, the backend connection is returned back into the pool and the next waiting client connection gets to reuse the same connection immediately. In practise this provides quick response times for queries as long as the typical transaction execution times are not excessively long. This is the most commonly used PGBouncer mode and also the Aiven PostgreSQL default pooling mode. The third operational pooling mode is "statement" and it is similar to the "transaction" pool mode, except that instead of allowing a full transaction to be run, it cycles the server side connections after each and every database statement (SELECT, INSERT, UPDATE, DELETE statements, etc.) Transactions containing multiple SQL statements are not allowed in this mode. This mode is sometimes used for example when running specialized sharding front-end proxies. This the overview page for our PostgreSQL service in the Aiven web console. You can connect directly to the PostgreSQL server using the settings described next to "Connection parameters" and "Service URL", but note that these connections will not utilize PGBouncer pooling. 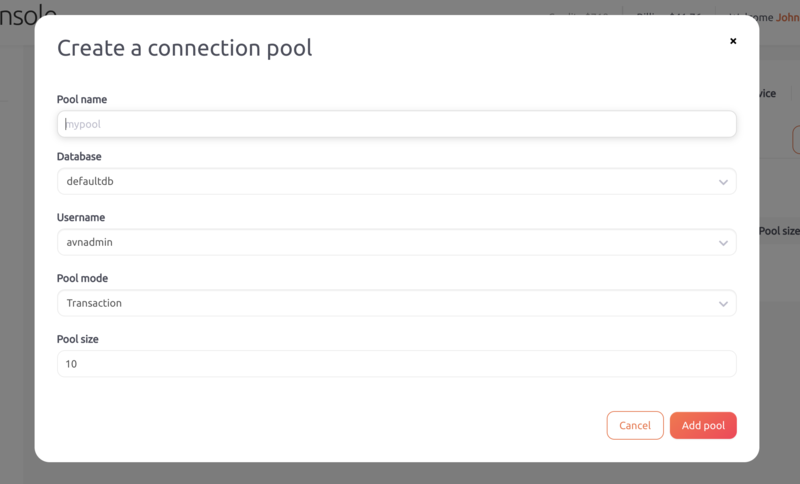 Pool name: Allows you to name your connection pool. This will also become the "database" or "dbname" connection parameter for your pooled client connections. Clicking the "Info" button next to the pool information shows you the database connection settings for this pool. Note that PGBouncer pools are available under a different port number from the regular unpooled PostgreSQL server port. Both pooled and unpooled connections can be used at the same time. For all business and premium plans, whenever you define a connection pool the same connection pool is created both for master and standby servers. For standby servers the connection pool URI is exactly the same as for master expect the host name has replica- prefix. 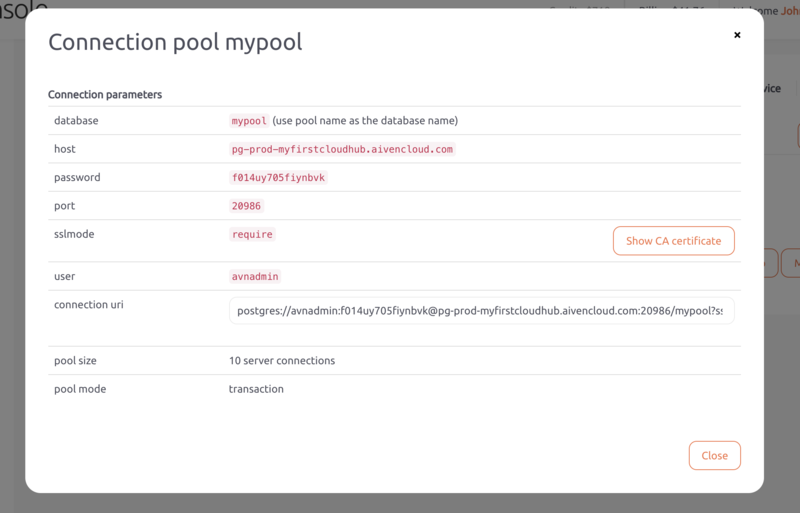 So if the master connection URI is postgres://avnadmin:password@pg-prod-myproject.aivencloud.com:20986/mypool?params then the replica connection pool URI is postgres://avnadmin:password@replica-pg-prod-myproject.aivencloud.com:20986/mypool?params . You can access PgBouncer statistics with avnadmin user (or service-specific username if overridden when creating the service) by taking the connection URL from above view and changing database name to pgbouncer . Run SHOW HELP to see available commands. Only read-only access is available, as PgBouncer pools are automatically managed by Aiven.